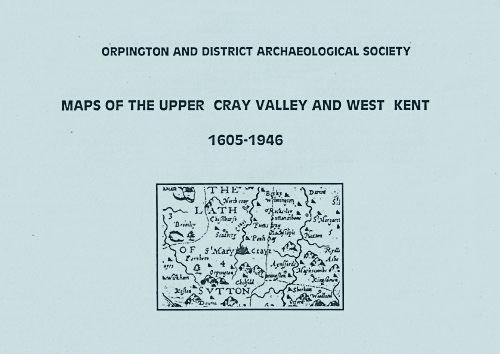 Maps of the Upper Cray Valley and West Kent 1605-1946 by Janet Clayton and Michael Meekums. A collection of reproductions of maps and part maps which illustrate the changes in this area from the time of Queen Elizabeth I to the end of the second world war. Included are Philip Symondson’s map of Kent (1659 issue, but the Cray area is unchanged from the original 1596 edition), the Andrews, Herbert and Dury map of 1769, Hasted’s map of 1797, 1930s Ordnance Survey maps, and many others. 24 pp., 19 maps. A3 spiral bound, card covers. Published 2003. Price: £8.00 plus £4.00 postage. 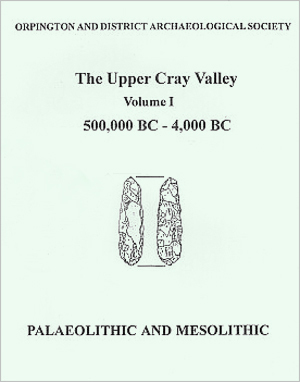 An indispensable compendium of maps and tables which show the locations of all archaeological sites and find spots in the Upper Cray Valley from 500,000 BC to 1603 AD, giving brief details of each and references to the relevant literature. This work is available as a series of parts each focussing on an individual period. Each of the individually published parts consists of a brief description of the period covered, with location maps and tables relating to archaeological excavations and finds. 23 pp. Stapled A4, card covers, published 2002. Price £2 plus 93p postage. 23 pp. Stapled A4, card covers, published 1993. Price £2 plus 93p postage. 33 pp. Stapled A4, card covers, published 1993. Price £2 plus 93p postage. 17 pp. Stapled A4, card covers, published 1996. Price £2 plus 93p postage. 24 pp. Stapled A4, card covers, published 2007. Price £2 plus 93p postage. The Upper Cray Valley. 500,000 BC – AD 1603. Millennium Edition by Michael Meekums. A compendium of all the above parts. 113 pp. A4 spiral bound with card and plastic covers. ISBN 0-9539385-1-4, published 2001. Price £10 plus £2.80 postage. 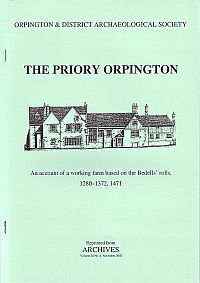 The Priory estate at Orpington was a working farm in mediaeval times. This account of it is based on the Bedells’ Rolls of 1280 – 1372 and 1471. The author is a former Curator of the Bromley Borough Museum, which is situated at The Priory, Orpington. Reproduced from ODAS Archives, 24, 4, 56-86, 2002. 31 pp. Stapled A4, card covers. Price £3.00 plus 93p postage. A Mesolithic Site in the Priory Gardens, Orpington by Tony Grey and Alan Tyler. An account of a mesolithic flint industry in the Museum grounds (one author (A.T.) is a former Curator) with illustrations of some of the 3364 flints excavated. Reproduced from ODAS Archives, 13, 3, 44-75, 1991. 32 pp., 3 figures, 145 illustrations. Stapled A4, card covers. Price: £2 plus 93p postage. Villare Cantianum: or Kent surveyed and illustrated by Thomas Philipott, 1659. 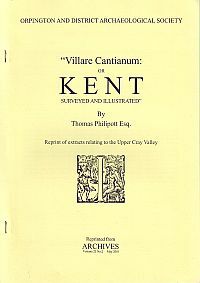 A reprint of those parts of this early history of Kent which relate to the Upper Cray Valley. It gives an account of the old manorial families; the author was Somerset Herald. Some spellings have been modernised. 14 pp. Stapled A4, card covers. Price £1 plus 93p postage. The River Cray: its size in past times by Alan Hart. Was the Cray much larger in the past than it is now? This interesting question is discussed in the light of historical, archaeological and geomorphological considerations. Reproduced from ODAS Archives, 20, 2, 1998 with additional maps. 12 pp., 5 maps, 2 b.w. photographs. Stapled A4, card covers. Price £1.50 plus 93p postage. 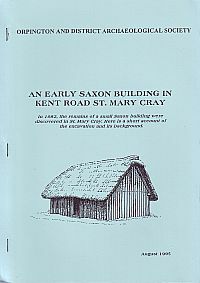 An Early Saxon Building in Kent Rd, St. Mary Cray by Alan Hart with illustrations by John Blundell. A short account of the excavation of a small Early Saxon building discovered in 1982, and its significance. 4 pp., 2 illustrations. Stapled A4, card covers. Price: £1 plus 93p postage. Excavations at the Romano-British bath-house, Poverest Road, Orpington, 1993. by David Tyler and Alan Tyler. The report on the partial re-excavation of the Poverest bath-house. 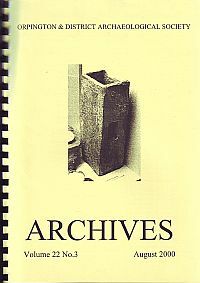 With specialists’ reports on pottery and metal-working debris. One author (A.T.) is a former Curator of the Bromley Borough Museum, which is situated at The Priory, Orpington. Reproduced from ODAS Archives, 17, 2, 23-46, 1995. 24pp., 6 figures. Stapled A4, card covers. Price: £2.50 plus £1.70 postage. Roman Flue-tiles in the Orpington Area by Hazel Shave. After a general discussion of methods of tile production, and their types and uses, specimens of flue tiles excavated in the Orpington area are classified and illustrated. From a dissertation by the late Hazel Shave, a longstanding ODAS member, for her Diploma in Field Archaeology. Reproduced from ODAS Archives, 22, 3, 41-83, 1995. 43 pp., 9 figures, 19 pp. of tile illustrations. Stapled A4, card covers. Price: £4 plus £1.25 postage. St. Mary Cray Parish Church by John Blundell. Illustrations by the author. Concise and well illustrated information about this 13th century church. Reproduced from ODAS Archives, 21, 2, 23-29, 1999. 9 pp., 1 map, 5 illustrations. Stapled A4, card covers. Price: £1 plus 93p postage. timber-framed building in St. Mary Cray which was surveyed and excavated by ODAS before extensive conservation and rebuilding. Reproduced from ODAS Archives, 20, 3, 33-41, 1998. 9 pp., 2 figures, 1 map, 1 b.w. photo. Stapled A4, card covers. Price: £1 plus 93p postage. The Blue Anchor Public House, St Mary Cray by Janet Clayton, with structural drawings by Michael Meekums. 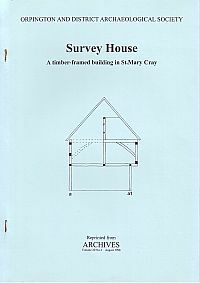 The structure and history of a timber-framed building in St. Mary Cray which has been surveyed by ODAS. Reproduced from ODAS Archives, 20, 4, 56-64, 1998. 9 pp., 2 figures, 1 map, 1 illustration. Stapled A4, card covers. Price: £1 plus 93p postage. 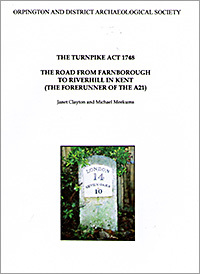 The Turnpike Act 1748 – The Road from Farnborough to Riverhill in Kent (The Forerunner of the A21) by Janet Clayton and Michael Meekums. Introduction to turnpikes and a description of the route from Farnborough to Riverhill. Photographs of mile stones along the route, maps and a reproduction of the 1748 Act. 41pp., 5 illustrations, 3 maps, A4 Stapled, Card Covers, Price £4.50, plus 93p postage. Pure Aerated Waters: The Chislehurst Mineral Waters Company. By Janet Clayton. A well illustrated account of these locally made waters, which were very popular in the second half of the 19th century. 11 pp., 10 illustrations (2 in colour), 1 map. Stapled A4, card covers. Price: £2 plus 93p postage. 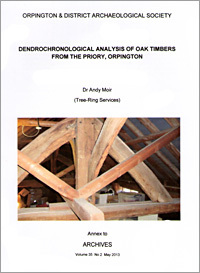 Dendrochronological Analysis of Oak Timbers from the Priory, Orpington by Dr Andy Moir. The Priory is a fine example of a medieval hall house. It was rebuilt in stone in 1290 and added to in 1393 and 1471. Dr Andy Moir has taken 12 samples of the oak roof timbers and carried out a dendrochronological analysis of them. This analysis provides evidence to show that the construction of the South range occurred in AD 1521. This is his full report. 24pp. Stapled A4, card covers, Price £3.00 plus £1.24 postage. 19 pp. Stapled A4, card covers. Price: £1 plus 93p postage. 16 pp. Stapled A4, card covers. Price: £1 plus 93p postage.